It was actually thanks to a comment posted by Chris Hodges that inspired today’s lovely post (thanks muchly, good sir) when he made mention of the Zelda controller in the background of the image I had chosen for my post about The Last Story. Few images could be found for the game (aside from lots of people dressed as Calista, which is all well and good, but not really what I had in mind), and I had to settle with an image where, admittedly, that lovely gold (real gold, I swear, I’m not fibbing in the slightest at all) controller stole the spotlight from what should’ve been the real star of the image. But, alas, I get ahead of myself. You see, I am a proud owner of the golden Wiimote that was released in celebration of The Legend of Zelda 25th anniversary. It was one of the first times I had ever gotten something limited edition, and it brought a question into my mind, and a story. Let’s start with the story, shall we? It was 2002. Or thereabouts. The Legend of Zelda: Wind Waker, the first Zelda game to surpass the 64-bits of the N64, was about to be released, and my friend informed me that she had preordered the game, and only the few who had done so would get the honor of receiving not only the game, but the Ocarina of Time “Master Quest”. I needed this game of limited quantity. I needed it bad, so I ran down to Wal-Mart early one morning, and I asked, nay, I demanded (no, I really just asked) to preorder the game…and they had run out. I don’t know how you run out of something that has yet to be released, but they could only allow about 10 people preorder (what the heck! ), and I was not among their lucky ranks. 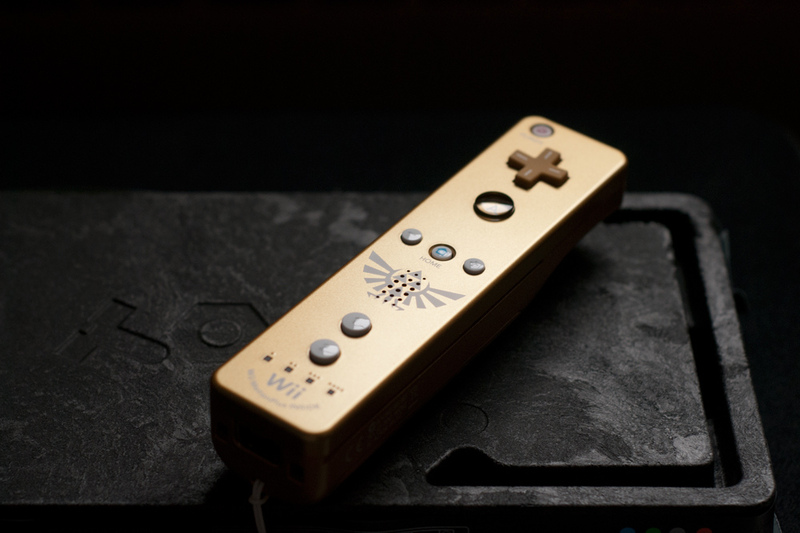 I never really got the opportunity to get anything limited and sought after until I got that golden Wiimote. Sure, I have some limited edition Pokemon cards, but according to Amazon, they’re worth a penny or two, so apparently they stamp “limited edition” on just about everything. I fully planned on getting the version of The Last Story that came with an art book on Amazon, but then I saw it on sale at the game store and relented. I never even heard of the limited edition copies of Rayman Origins available online until after I had completed the game, which came with artwork and a soundtrack CD (which I would have loved, as that game has one of my favorite soundtracks of all time), and I was once enamored by this beautiful 3DS that depicted Link riding on Epona across the fields of Hyrule on the back, but I didn’t want the 3DS at the time and couldn’t justify spending that much money just for a pretty picture. And then, one day, I got my chance. Skyward Sword was going to be released for the 25th anniversary of the series, and they had a limited edition version that would include a golden Zelda Wiimote, complete with that Triforce bird thingy, and a CD with some orchestrated Zelda music. It was only about $70-80, and I needed one of those Motion Plus controllers to play the game anyway, so I preordered it, and unlike my friend all those years ago, I was able to pick up my copy of the game the same day it was released (I also bought the calendar, which was not limited, but it’s still pretty cool and includes the image found on the back of the 3DS, which is a nice bonus). I love that controller (the CD is okay; I would’ve preferred the soundtrack of Skyward Sword, but I suppose I can’t be picky), and I was pleased all the more when I saw the limited edition version of the game to have doubled in price on Amazon shortly after I got it. I’m not really sure why I was looking, but that was pretty neat to know I had something others sought after. So now, my question. Are you the kind of person that will spend more for the limited edition of a game, or do those kinds of things not interest you? I’d love to hear your thoughts! A Limited Edition Duck…How Many Ducks Do You Know That Can Type? That’s true, if there are a bunch of editions, there is less motivation to buy it. There are certain movies that are released with a bunch of different editions, and I won’t buy those. I do love limited editions when they include art books, music CDs, and the like, though. If they give me something physical that I can actually pick up and look at, I’m far more likely to get it. I didn’t catch Limited Edition fever until my roommate got the Fire Emblem 3DS. I was, and still am surprised of the jealousy that piece of hardware brings out in me. I love unique looking consoles and handhelds. I checked that Fire Emblem 3DS out. It looks pretty cool. I have a Pokemon one because it looked nicer than the plain ones, and I’m not even much of a Pokemon fan anymore. I also have a Pokemon Gameboy Color. It switches between gold and silver depending on the angle at which you hold it, with Pikachu and Pichu on it, and the red light when it’s on is Pikachu’s cheek. It’s pretty neat. I hope you saw the smaller one, not the XL version. The smaller one has a gradient on the front, and it looks pretty sweet to hold. My first ever console was the purple see-through Gameboy Color. I loved the thing, and always had it with me. I’m glad I didn’t know about that GBC when I was a kid. My parents would’ve gotten an earfull! I’m not sure which version I saw. That sounds pretty cool, though. I actually had a see-through GameBoy Advance myself. I think mine was purple, too. It was neat. I liked being able to see its innards.